GetSpool 2019 - Jailbreak Tweaks, iOS News - GetSpool features iOS Jailbreak, Cydia Apps, Theme Reviews, Tweaks, iPhone, iPad, Apple TV and iPod news. Do you want to bind your life with a photography? Or, maybe, you are already an experienced photographer and want to promote works via the Internet? An own website is a great chance to share your photos with the whole world. With a website, you can offer your services to millions of people and even become a famous photographer in the future. While you decide on establishing the site on your own, ready-made template is right what you need to implement the idea. Literally, the success of your website depends on a correctly chosen theme. Before opting for a template, decide on how your site should look like, which exact options should include etc. These criteria are important, especially if we are talking about career and self-realization. That is why we’ve collected 5 portfolio HTML templates that can change the idea of how to promote yourself as a photographer. 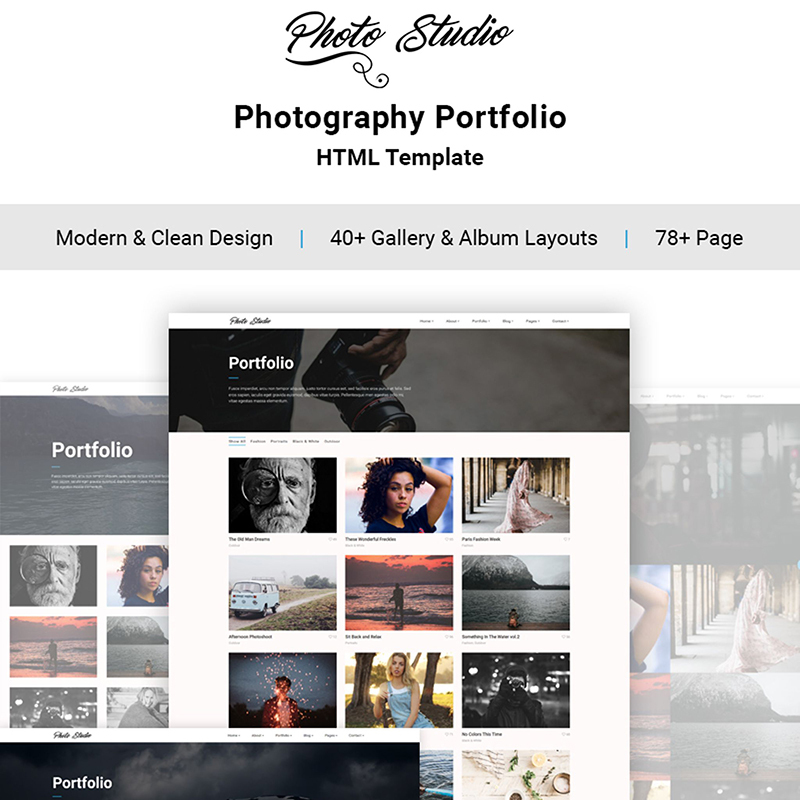 Photo Studio is a fully responsive HTML5 template that has been created to be a universal weapon for any photographer who wants to run his own website. This template can be the same great choice for both amateur and professional photographer. It has a stylish and eye-catching design that is very important for such type of websites. Multiple gallery and album layouts will help you upload all your astonishing photos and organize them into different albums. Besides, “Photo Studio“ template is really easy to customize. It does not require any programming skills. All you have to do is just drag elements to the main page, set blocks as you like and enjoy your new, amazing website. Even if something in your template is not clear to you, you may check accurate documentation that comes with a template or contact 24\7 support team to get the fast solution to any of your questions. 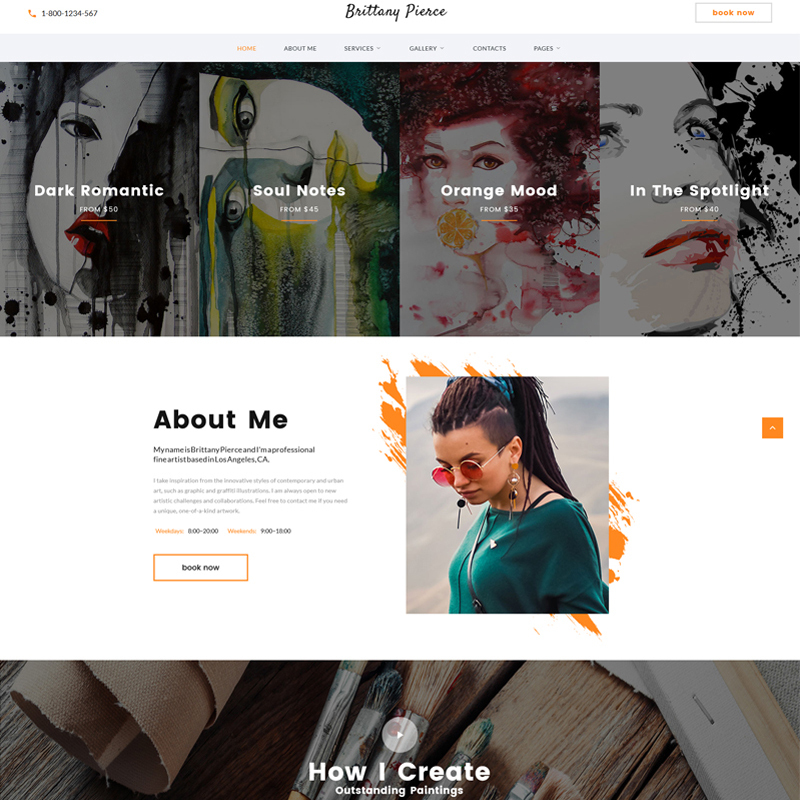 Brittany Pierce is a beautiful artist portfolio HTML5 template that can be used for a photographer’s portfolio website or personal photo blog. The theme comes with an advanced set of features and instruments that allows you to create a website exactly as you need. Different web forms and letter subscription option can be an additional way to stay in touch with your clients. Moreover, you can set up the blog in a few clicks and start to spread your thoughts and share them with your website visitors. 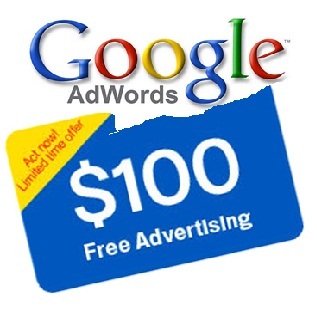 In addition, this theme is search engine friendly which will help you reach a high position in the Google search results. Thanks to fully responsive design, you can be sure that your website will work properly on any mobile device and people will enjoy the beauty of your photos from their smartphones. So, if you need a highly-functional template for your photographer’s website, you should take a closer look at Brittany Pierce. Are you looking for the best way to present your photography works on the web? Susan Parker multipage template is a great solution for such purposes. This fully responsive theme has a modern, stylish design and is very easy in use, what matters for beginner users. Thanks to the drag and drop page builder, you can easily set every page and make your website ready in a short time. Even if you do not want to build pages on your own, there is over 25 ready to use HTML5 pages. Besides, the template includes different plugins that can make your work much easier. E.g. Appointment Manager that allows your client to book an appointment at a convenient time. Different gallery types like grid, masonry, and cobbles can give you an additional way to show your best works. Well-commented and SEO friendly code will make the work with code easier and help to reach the top of Google search results. Laterna is one more photography related template that has been made in the bootstrap framework. It has 2 different versions: dark and light, so you can choose which one fits your style and mood in the best way. Both themes include the same content. They have 3 different styles for portfolio, 2 versions of the home page and 2 types of blog. Template is fully customizable and does not require any coding skills. Even if you have some questions regarding your theme, professional agents from 24\7 support team are always ready to help you out. We know the importance of the pictures quality and their look on a website, that is why this template is mobile friendly. Thus, you can be sure that your pages and photos look properly on any tablet or smartphone. In short, this template can be a great choice, if you want to make an accent on style and appearance. 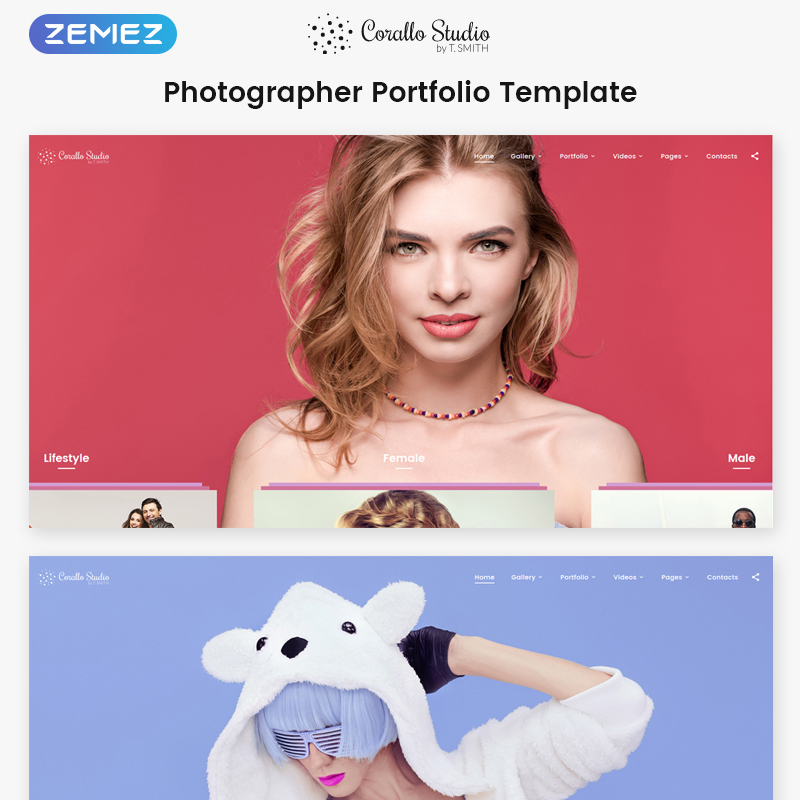 Coral Studio is a fully responsive HTML5 template with Parallax effect and tons of features to make an astonishing website with amazing functionality. It includes a huge set of UI elements which can create an impressive appearance of pages and pleasant user experience. Cool CSS3 animations that come with this template also add a modern look to your website. A huge variety of album, gallery and portfolio layouts gives you a lot of different ways to show off your works to viewers. Wonderful blog feature can be a nice way to communicate with your site visitors or just to share some important information. A convenient contact block and multiple web forms make your website more comfortable to use. More than 30 ready-made pages are also included to this set. 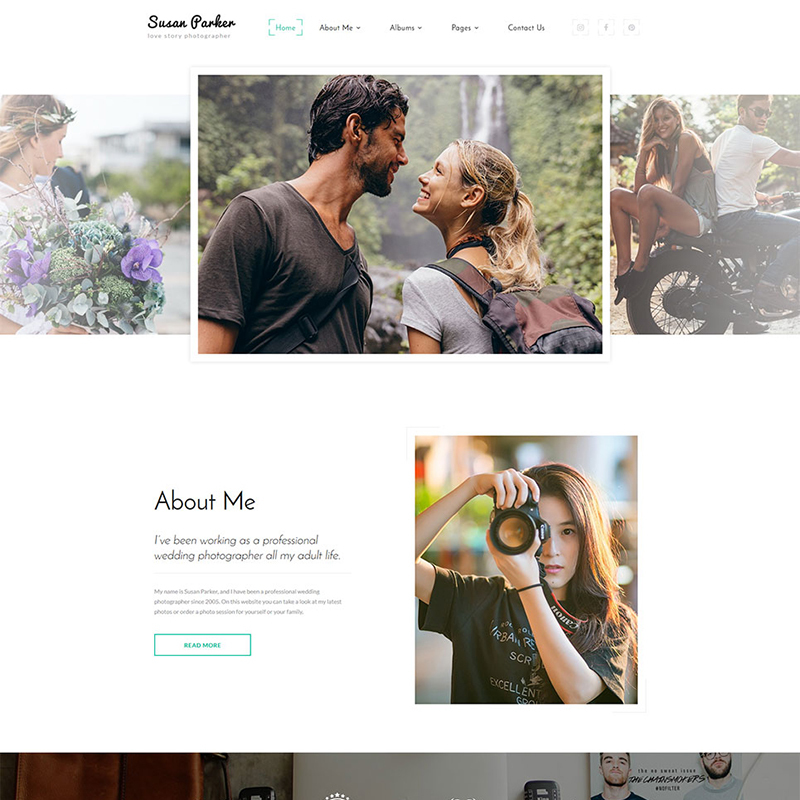 In a bundle including detailed documentation and 24\7 support, this template is an ultimate pack for creating an awesome photographer’s website. With no doubt, photography website templates are versatile. Some of them are made with an accent to the visual part of the website. While the other has an amazing variety of options and features resulting in advanced functionality. I can not say which is the best one exactly. Every template has been developed to cover specific purposes. Thus, everyone can find a template that meets all his needs when checking out this list of themes. We hope that you’ll also find one that would become a starting point of your future successful photography blog or portfolio of a famous photographer. Are you passionate about traveling and love spending time abroad, getting to know different cultures and sharing your experiences with the public? Or do you run a travel agency that helps people spend their vacations all around the globe? Regardless, to be successful nowadays you’ll absolutely need a website of your own. It will help you find new audiences and customers much easier since people spend significant amounts of time online now. So, what’s the quickest way of building a website? Of course, it is purchasing a ready-made template. It is also the most cost-efficient way of doing it since you don’t have to pay a developer to do all the coding for you, which can get a little costly. 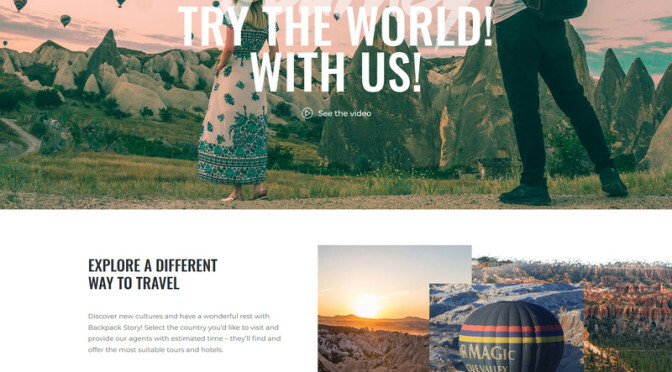 So, today we present to you a small collection of the most impressive WordPress website designs tailored to the needs of both bloggers and travel agency owners alike. 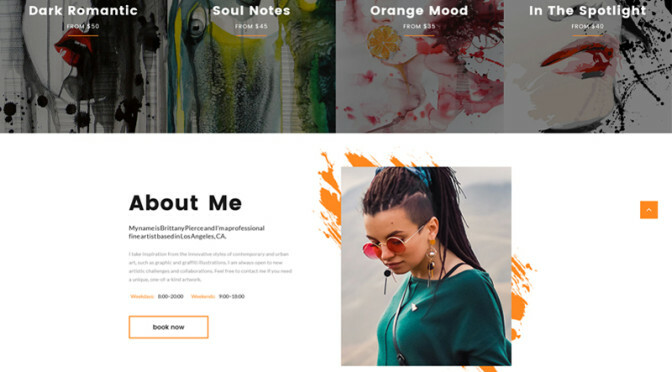 Scroll down and you’ll find 10 amazing, professionally crafted themes well-suited for the task of creating a solid online presence for you or your company. Tourizto is one of the most popular solutions for travel blogs and travel company websites. It’s convenient admin panel houses all the options that you need to create a good-looking site. It is also integrated with the Elementor drag & drop page builder, which lets you customize your layouts in a user-friendly visual interface. It is further supplied with the JetElements plugin which extends Elementor’s capabilities even more. A huge selection of custom widgets like Carousel, Google maps, and many others allow you to create a truly unique and functional design quicker and easier. With Mega Menu’s integration, you will be able to build your own menu designs with as many tabs, categories and subcategories as you deem necessary. 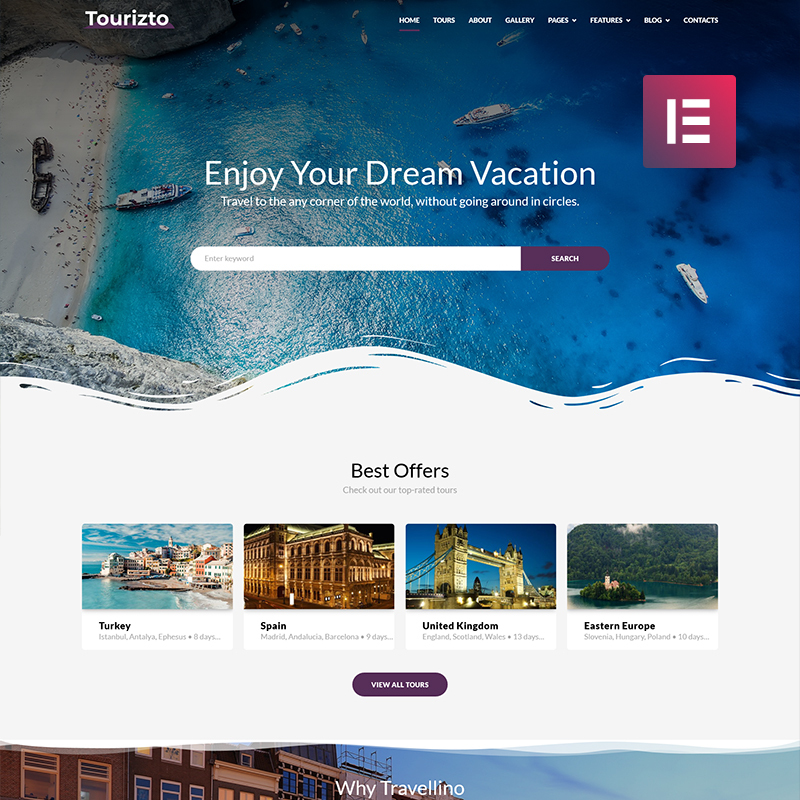 Tourizto’s SEO optimization is on point, ensuring that your page ranks in the top search results of Google and is fully responsive design ensures pixel-perfect looks and top-notch optimization on all kinds of devices. 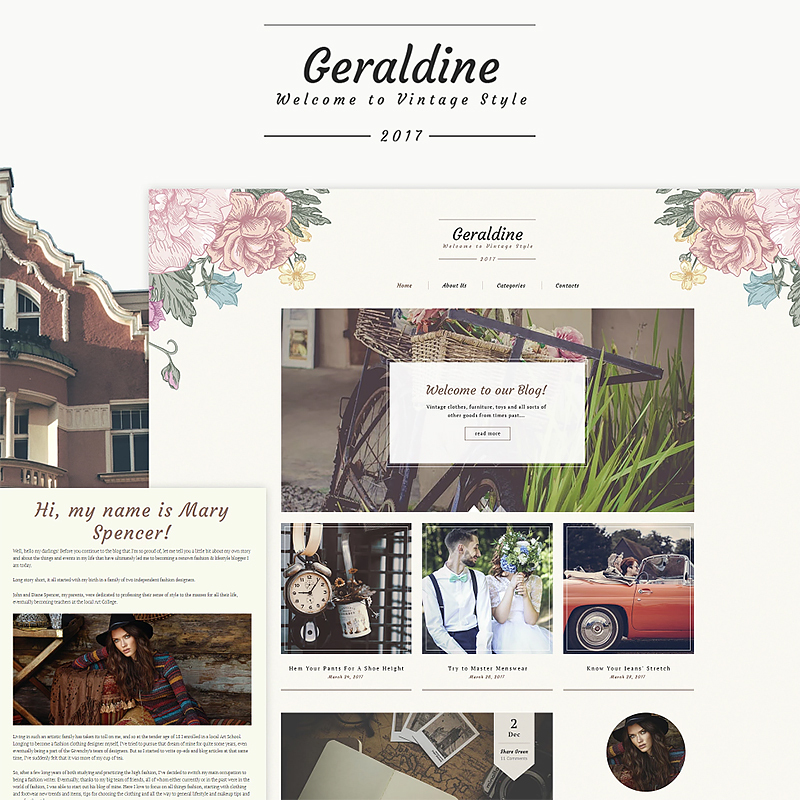 Journez is one of the most thrilling and elegantly designed themes for you roadsters. Its stylish design is quite unique and will catch your visitor’s attention as soon as they enter your page. Its customization requires absolutely zero coding knowledge thanks to its integration with the Elementor drag and drop page builder paired with the JetElements plugin. 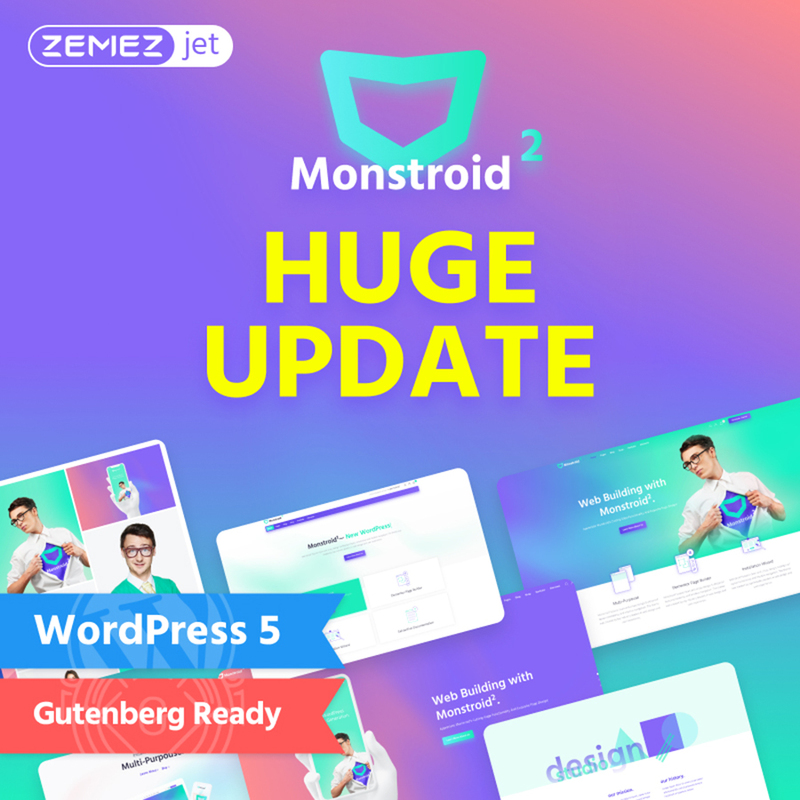 The theme has been built with JetThemeCore, allowing you to create custom headers and footers, or pick pre-designed ones and edit them to suit your needs. JetBlock integration means easy addition of authorization links, hamburger panels, login forms and changing similar elements up. Journez’s layout was created with the mobile-first philosophy in mind, making your site a perfect fit for screens of all sizes. It is also supplied with a variety of pre-designed pages to swap around quickly should you feel the need for change. OnVacation is a beautiful theme that sports an outstanding design and an impressive set of technical features. It’s cross-browser compatible, fully responsive layout will be displayed on any device perfectly. 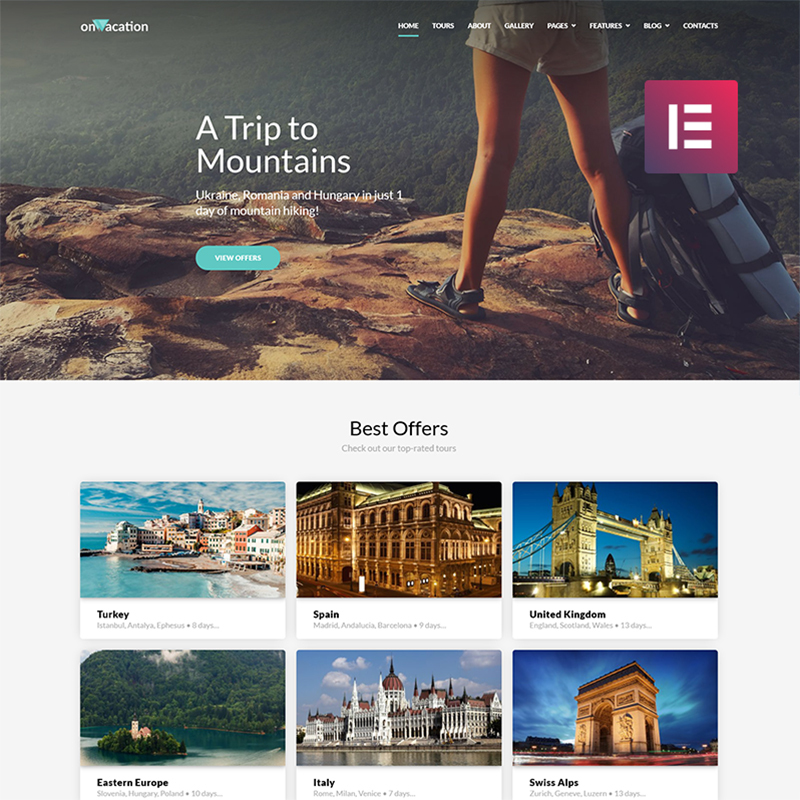 Its clean and professional design is easily tweaked due to integration with the Elementor Page Builder, Jet Elements and a user-friendly admin panel that houses tons of options in a neatly organized interface. Google Fonts are included, giving you access to an entire library, including several hundreds of unique fonts to work with. 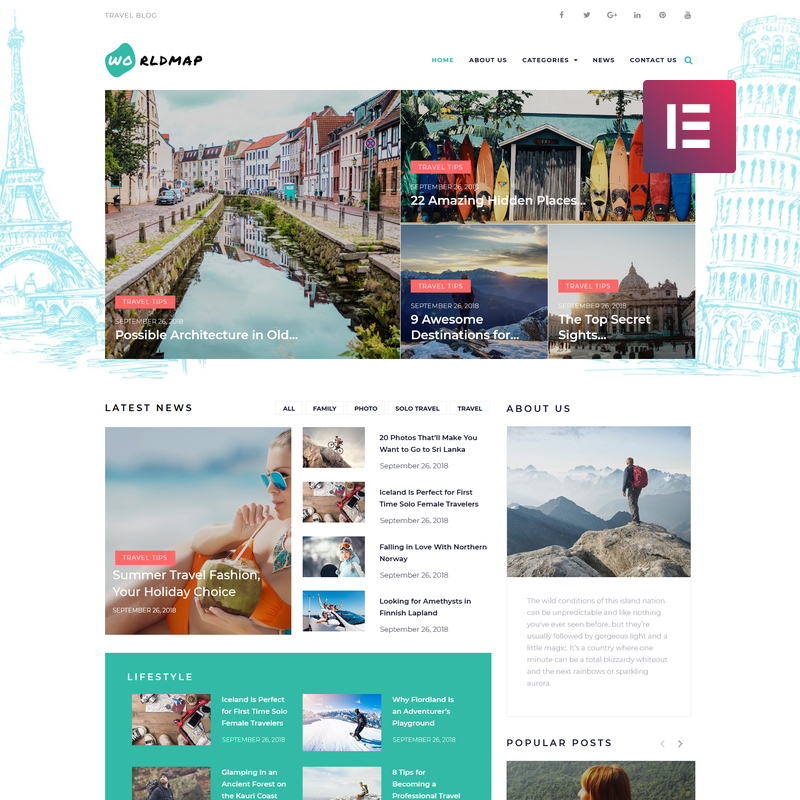 OnVacation also comes with 4 ready-made Blog layouts so you can give your customers ideas of where they should plan their next trip. A variety of widgets for different purposes is included in the package too, improving your workflow quite significantly. The theme’s valid and clean HTML code is easy to read and edit should the need for it arises. 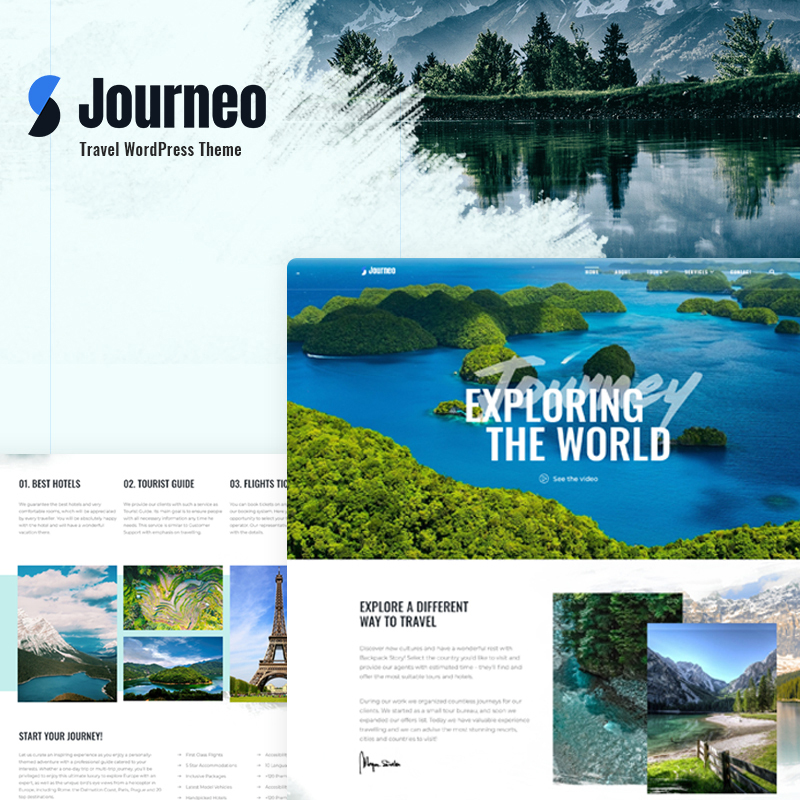 Journeo is a perfect theme for presenting your tourism services and packs enough punch to create a popular and profitable site for your business. It`s integration with the Jet Family plugins makes the page creation process simple and enjoyable. Create custom menus from varied presets and add subsections to them with JetMenu. JetElements provides you with tons of functional widgets for adding various types of content and modules to your site without the need to ever touch code. Take advantage of JetBlog to showcase your posts in neatly organized content blocks that are easily customizable. 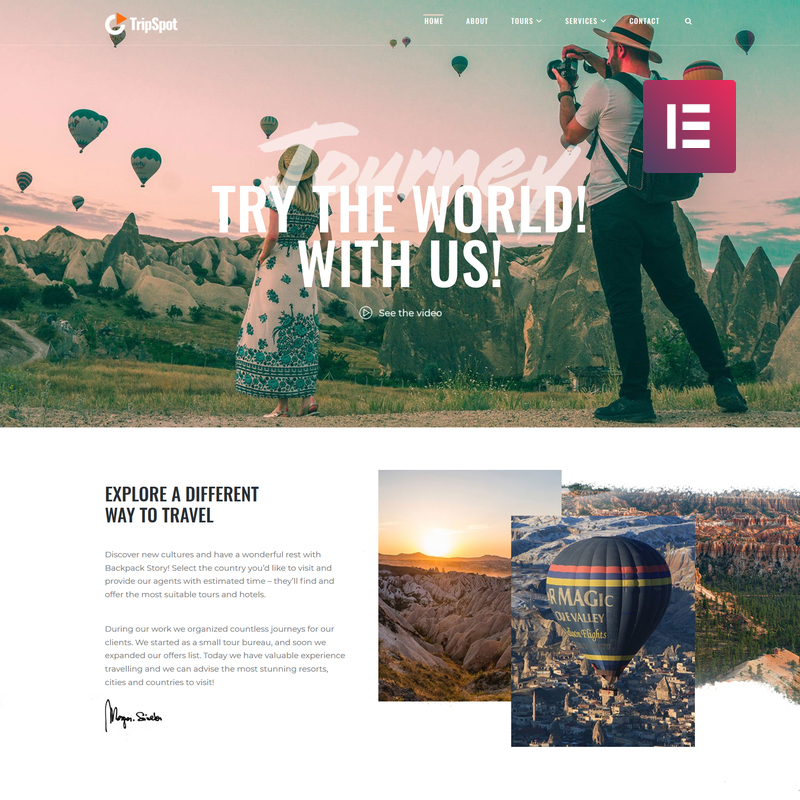 JetTricks even lets you apply parallax and other visual effects to your page, creating truly stunning presentations of your business. Contact Form enables your visitors to get in touch with you by means of a convenient form. Full responsiveness and good SEO optimization go without saying. WorldMap is the perfect match for you if you’re planning on creating a blog revolving around your own adventures around the globe. 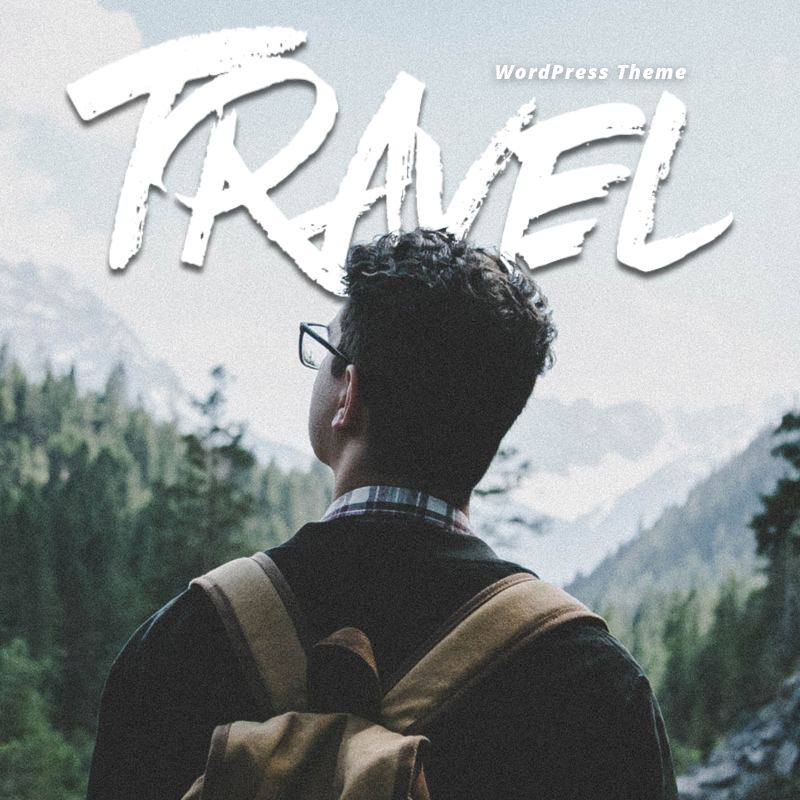 Customize it with Elementor and show off your breathtaking photos from the places you’ve visited, write and edit your blog posts, take advantage of social media icons and other elements and features to create something truly eye-catching. JetElements and JetBlog, which are practically mandatory plugins for creating a successful blog are included in the package, providing you with basically unlimited site creation and blog posting possibilities. Place your pictures in the beautiful Gallery and spice up your content with beautiful scenery. Your visitors will have full ability to leave you their feedback and share their thoughts about your content on your pages. Embed video, pinpoint locations on Google maps, attach SoundCloud links and even more with a huge selection of handy widgets that are provided with WorldMap. 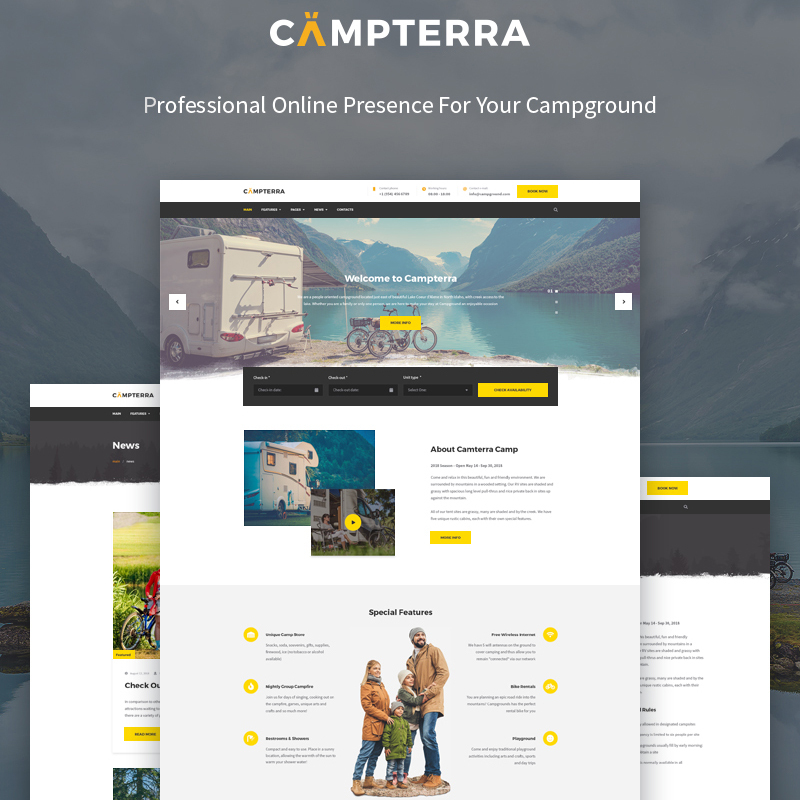 Campterra was created specifically for caravan parks, campgrounds and other types of camp tenting parks who rent pitches or RVs. You can use this template as both an impressive brochure website or turn it into a fully-fledged booking platform, letting your customers rent directly from your page. The integration of the MotoPress Hotel Booking plugin makes that not only possible but also easy to arrange. The theme’s perfectly structured design is well-suited for showing off your amenities, hookups, things to do in your areas, events and news and features call-to-action elements a guide-through map and more. Campterra’s reservation system is extremely flexible, allowing you to set dynamic pricing plans depending on the number of guests, length of stay and even season. 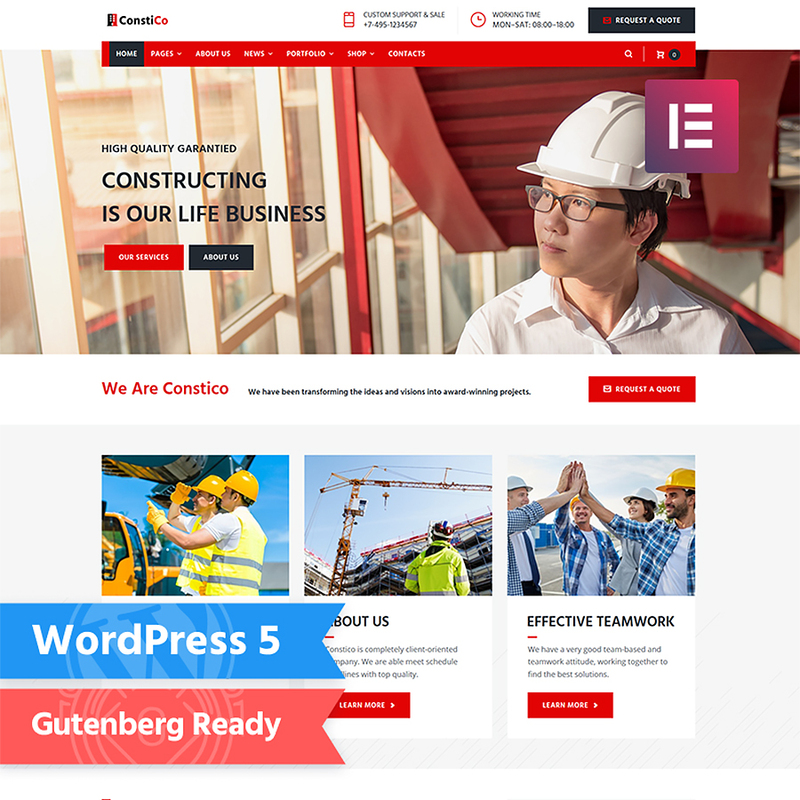 The theme is also designed and equipped with Elementor, one of the best website builders for WordPress and is fully translation-ready. TripSpot is a perfect solution for both personal blogs and commercial travel agency websites. Its stylish layout features informative blocks and elements provided by the Jet plugin set for Elementor. All of the provided plugins are easily installed with the help of the Jet Plugins Wizard. Place your content in cool tabs and accordion blocks with JetTabs. JetThemeCore gives you access to a huge library of pre-designed content blocks and sections via its Magic Button option. Spice up your content with vivid and eye-catching animation effects made available by JetTricks. Take advantage of JetBlog’s functionality to fill your headers and footers with exquisite widgets. Perfect SEO optimization ensures that your site won’t get lost between thousands of search results and will always rank high. The theme’s fully responsive, Retina-ready layout looks equally stunning on both the tiniest and largest of displays. If you’re looking for ways to present your travel agency in the most exciting way, look no further than Expanor. Its bright, memorable appearance offers high engagement and rich functionality. Enrich your site with useful information about your company, showcase your services, tours and much more. Ease of customization is ensured by Elementor integration along with an entire set of JetElements plugins. Create and customize mega menus with tons of style settings in JetMenu’s drag and drop interface. Dig around in JetThemeCore’s extensive library of pre-designed sections and create stunning layouts from scratch. Explore the huge selection of custom widgets to enrich every single of your site’s elements with visual effects or other cool features. And, of course, Expanor is fully responsive, Retina-ready and SEO-optimized making it both look and run equally amazing on all known types of devices and screen sizes. 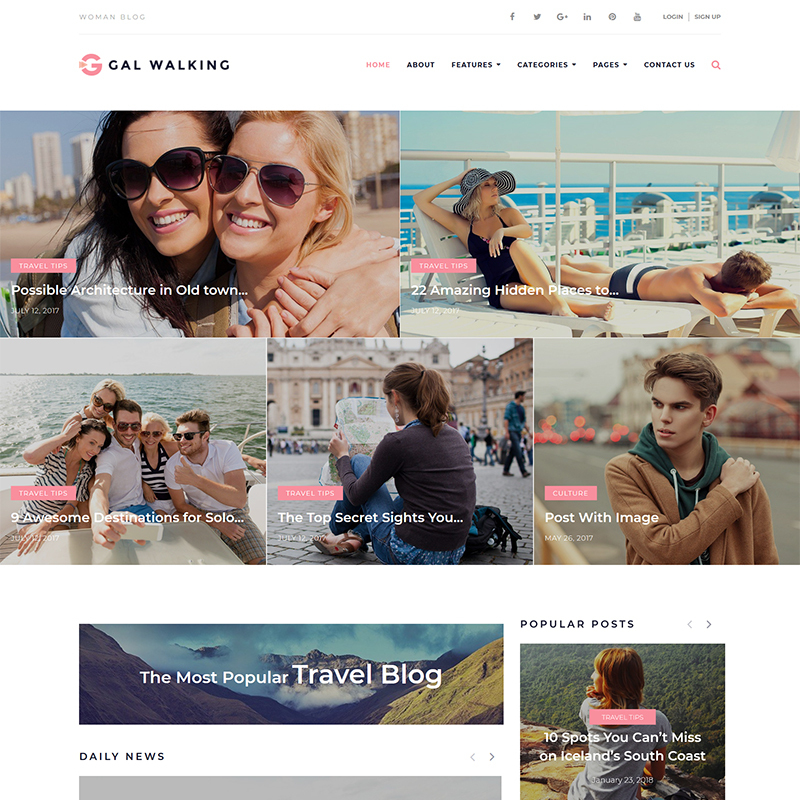 Gal walking is a clean and creative theme perfect for sharing your emotions, news, and videos on your very own travel blog. Its impressive slider, headers, and footers all come with a variety of customizable options for you to give your pages a little bit more of your own creativity. The template provides you with countless theme settings which allow you to customize categories, entries, and even your search results page. Social networking widgets are implemented so your visitors can like and share your posts on their social media profiles. Mega Menu provides you with a means to create flexible menus of your own designs to make navigating through your pages as seamless and intuitive as possible. On top of the myriad of pre-made elements and options, Gal Walking is integrated with Elementor, allowing you to edit your pages in a visual drag and drop interface. 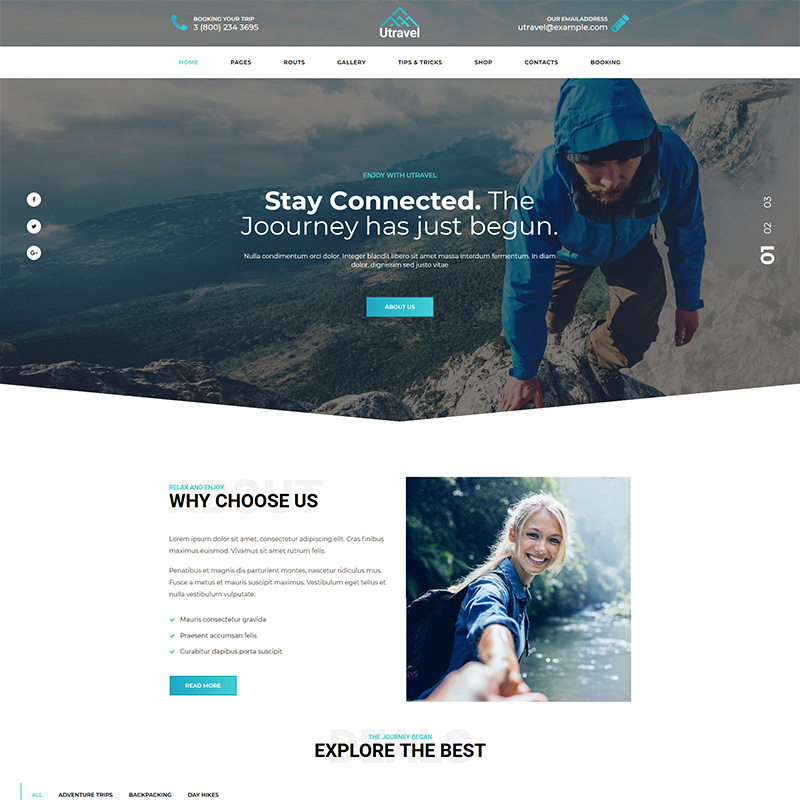 Utravel is a new theme created for hiking clubs, camping and any other websites related to outdoor activities. It packs all the necessary features for becoming a successful and professional representation of your business. Handy Appointment Booking gives your visitors the ability to book trips right from the convenience of your page. The theme’s installation should only take a few minutes and gives you an option of importing demo content to kickstart your page as soon as possible. Utravel’s source code is clean, thought-through and highly optimized for performance, so people leaving your page because of slow loading times is no longer an issue. Search engine optimization helps your page rank higher in Google and as a result get more traffic and potentially earn more money. The theme is also supplied with a visual page editor to streamline the customization process as much as possible. So, did anything on our list catch your attention? Did one of the themes strike you as a perfect candidate for using on your own project? Be sure to tell us in the comment section as we would love to hear all of your feedback or even success stories. And if you didn’t find something that fits your ideas and style preferences, don’t worry. 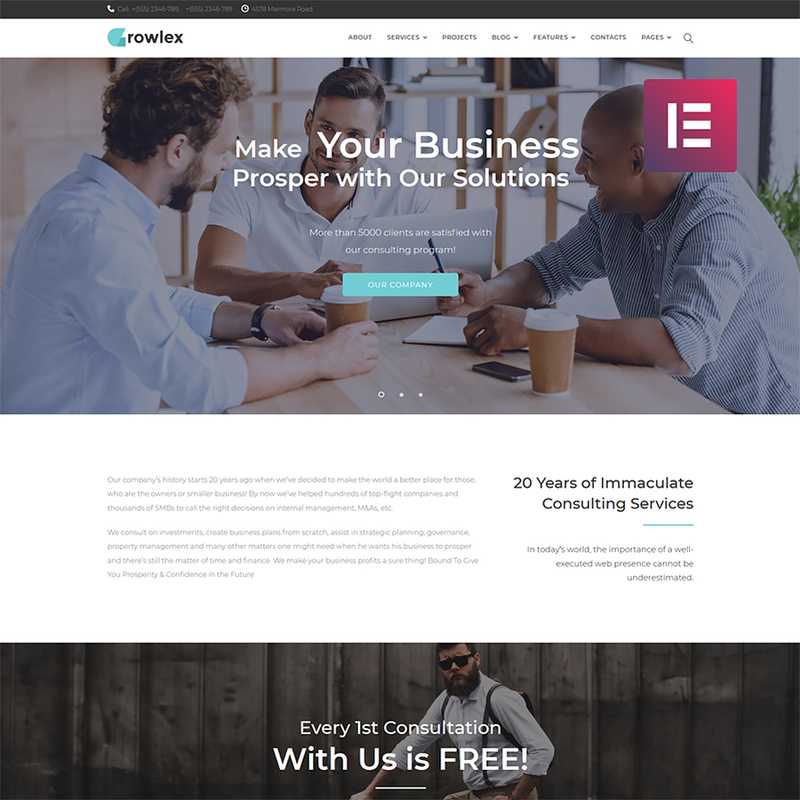 Be sure to check out TM’s website, where you’ll find huge selections of website templates not only for this particular niche but for countless other website types. Their stock is updated constantly, so you’re bound to find the perfect for yourself. The rotate video web app is designed to help you to rotate your videos. It is especially well suited to correct videos that have the wrong orientation, though it can also be used to prepare videos and address continuity issues in clips that you want to merge together. Essentially The rotate video web app is an online tool that exists as a website that you can access with any browser. All you need to do is upload the video that you want to rotate, and it will enable you to do so. The fact that it is web-based is definitely an advantage as it makes it accessible regardless of the device or platform that you’re using. It does not require any download or installation either. Adding to its appeal is the fact that the rotate video web app supports Dropbox and Google Drive – which are two of the more popular cloud storage services. That will make it easy for you to upload your videos to the platform. How to Use The Rotate Video Web App? Select the video that you want to upload and rotate. It is possible to select a file on your device, or one on Google Drive, Dropbox, or other online sources (via a URL). Click on the ‘Clockwise’ or ‘Counterclockwise’ buttons to rotate the video in that direction. Each click will rotate it 90-degrees. Preview the results by clicking play in the preview window. Set the output settings, including the format, resolution and quality of the video. Be sure to select whether you want to optimize it for web, PC, mobile or GIF – as the options will differ. Click on the ‘Rotate’ button to rotate the video. Download the video file when it has been rotated, or choose to upload it to Dropbox or Google Drive. That is really all that you need to do to rotate video online using the rotate video web app. As you can see it isn’t complicated at all, and there is practically no learning curve involved. In fact it shouldn’t take any more than a couple of minutes for you to rotate a video using it. If you want a simple way to rotate your videos orientation, the rotate video web app is a great choice. It is easy to use, straightforward, and will let you rotate your videos quickly. At the same time it will also let you set up the output options based on your specific requirements. All things considered the range of output formats and settings that it provides is actually fairly impressive. Make no mistake the rotate video web app is not a full-fledged video editor, nor does it pretend to be. Instead it is designed to fulfill a single goal: Allow users to rotate their video clockwise or counterclockwise in 90-degree increments – no more, and no less. Do you know the best way to overcome the decline in interest to your site after the New Year holidays? Start the preparation and transform the site for St. Valentine’s Day. The call to share love has a very powerful effect on those who have someone to give something for St. Valentine’s Day. In this article, you will find everything you need for your site. St. Valentine’s Day is associated with romance, gifts, and confessions. On this day, people try to express their love in a special way. Therefore, during this period everything should be based on romance. St. Valentine’s Day is the time when men are looking for presents, women dress up, and the owners of the sites decorate them creating a special mood. Of course, there’s plenty of options to design the site. However, only one is fast, not expensive, and rich in options. And It’s called ready-made solutions. 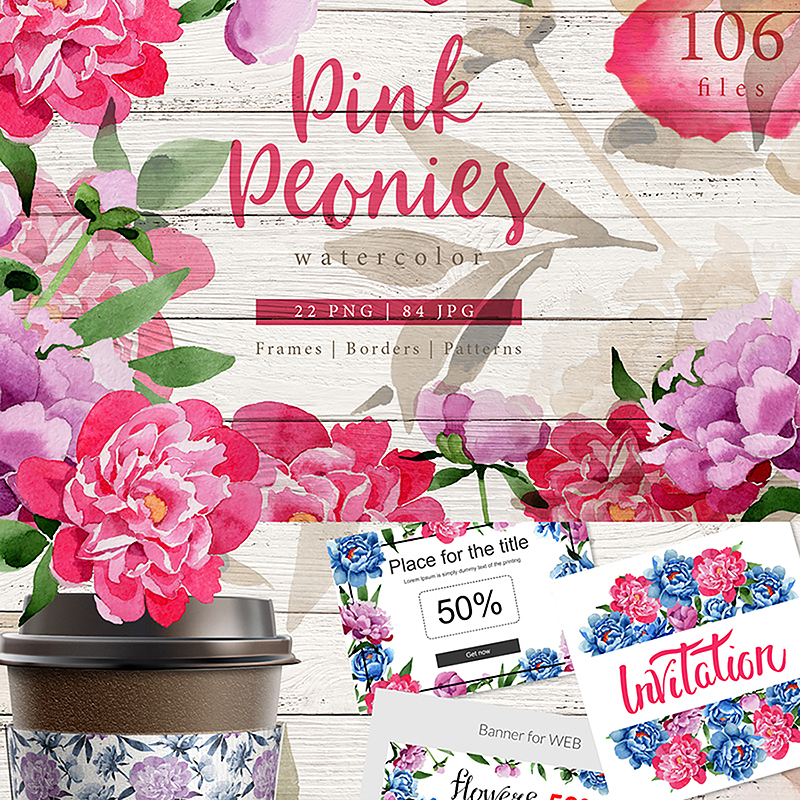 I mean WordPress themes, watercolor kits, decorative logos, and other pre-designed elements. Therefore, I collected for you a selection of holiday decorations for the site. Apply them and give your visitors a romantic mood. In addition, you can use watercolor illustrations for different purposes like postcards, cups, prints on clothes and so on. Besides, elements are painted by hand and every image is a separate file. Patterns and frames are JPG size 3500x3500px. Moreover, all illustrations are ready to print or use for anything you want. 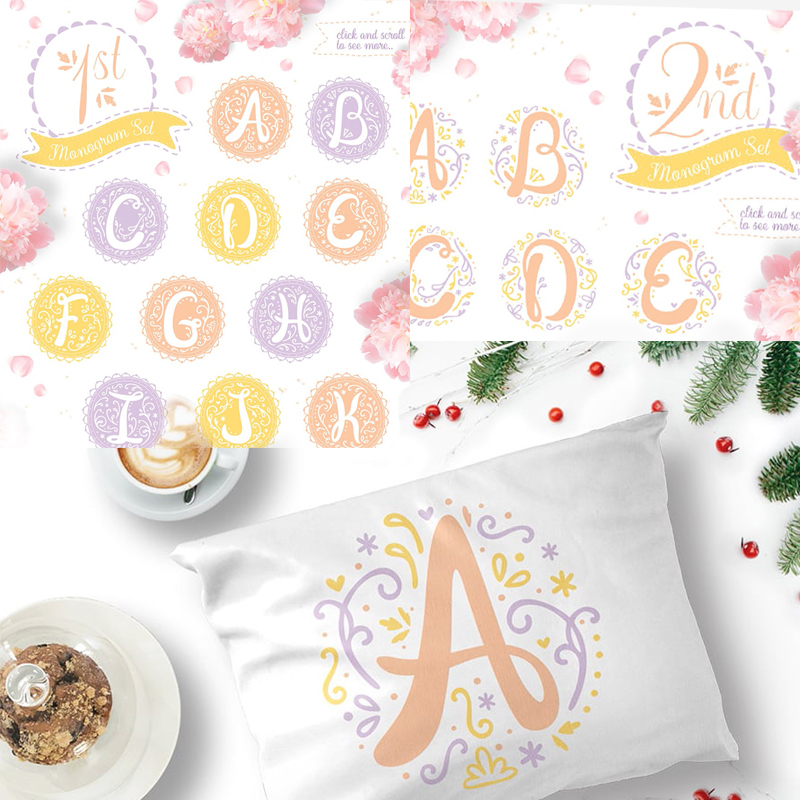 These lovely monograms are perfect not only for decorating sites but also for invitations, cards, branding, and much more. These monograms stand out by a wonderful color solution. At the same time, they are sufficiently neutral, so as not to draw the entire attention of site visitors to themselves. Because of this, you can use them either for St. Valentine’s Day or for any other holiday. And the price including the discount is only $3. Seems ideal, right? Hurry up to buy them with – for now, a discount is huge – 67%! 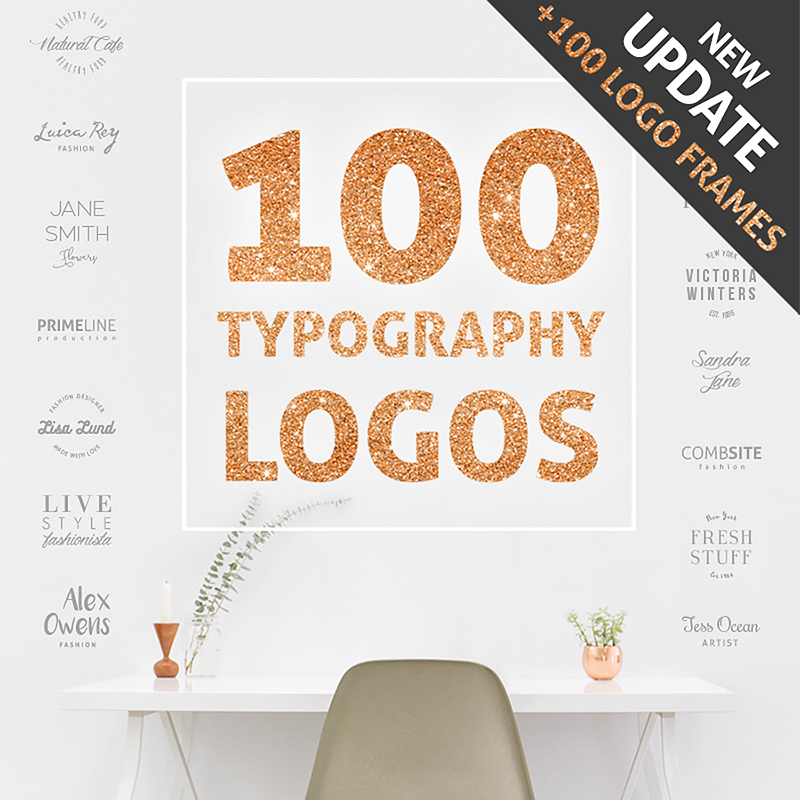 Here we have an awesome pack of 100 typography logos of different styles and 100 frames. With them, you get a great opportunity – to be all set for every holiday and every project! 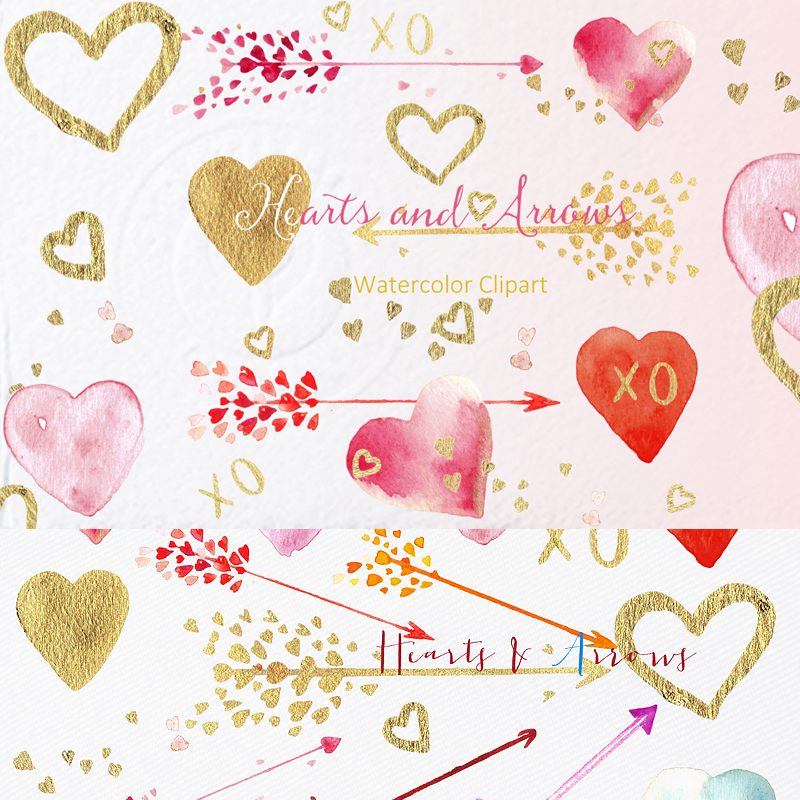 Beautiful lips, rose hearts, golden arrows, and tender flowers – this love story watercolor set is really perfect for St. Valentine’s Day! Using these illustrations, you can create your own unique design. 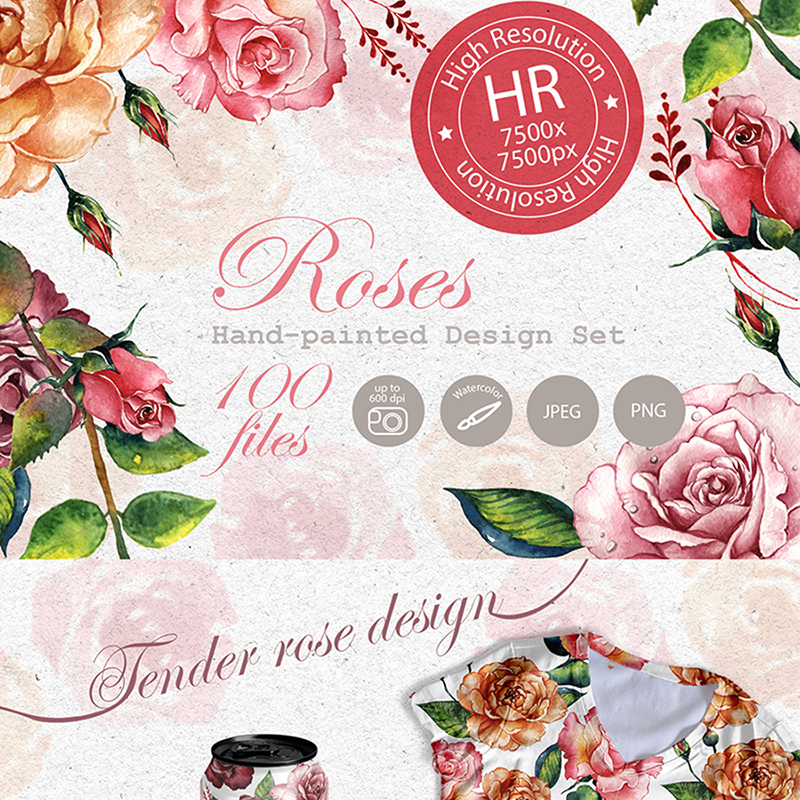 This pack has a gentle style that will appeal to all romantics. 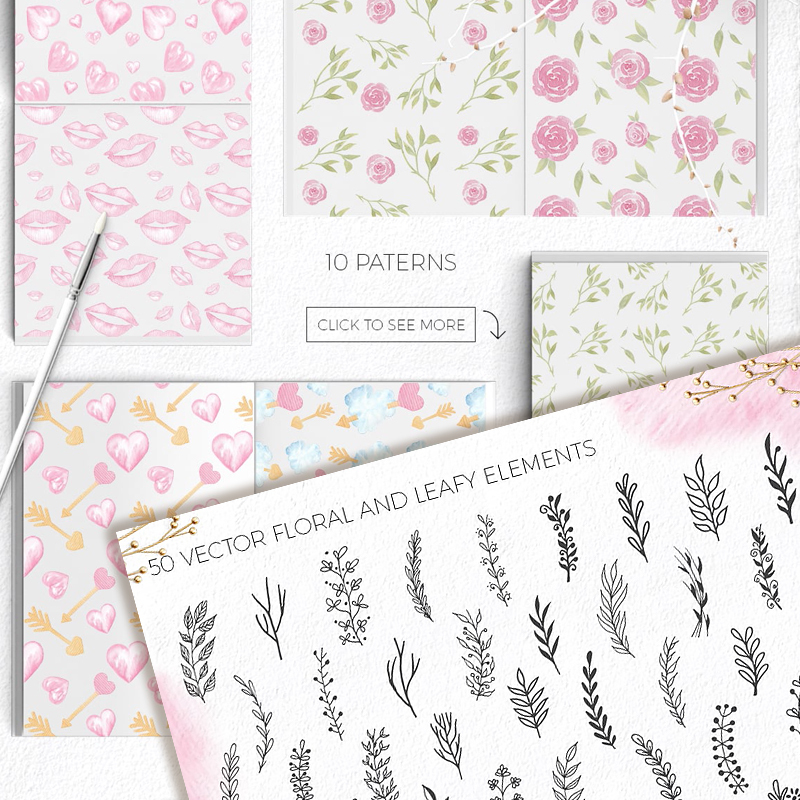 50 vector floral and leafy elements (EPS + isolated PNGs). And the price is so small that you will be pleasantly surprised! Follow the link above to see all the details. Fonts in web design are almost irreplaceable. Using non-standard and original fonts when developing a website design, you can achieve a truly amazing result. Development of banners, illustrations, various kinds of posters and other non-standard text-graphic materials also is completely impossible without special fonts. 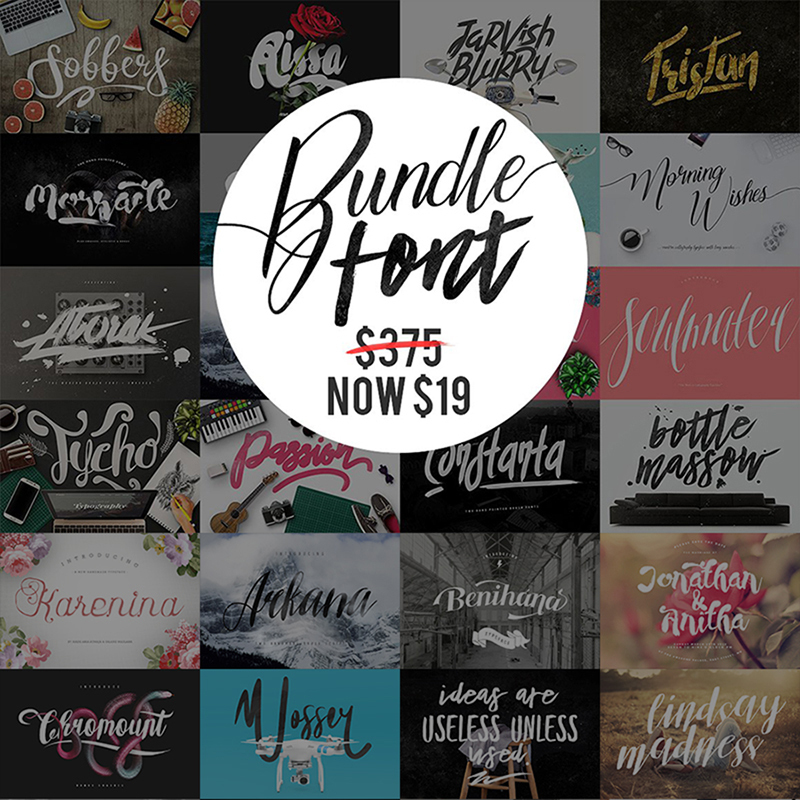 And there’s a great solution for all your needs – this pack has everything you have ever wanted to see in fonts. Besides, the price is unbelievably low – hurry up to get the pack before St. Valentine’s Day and use for your needs. 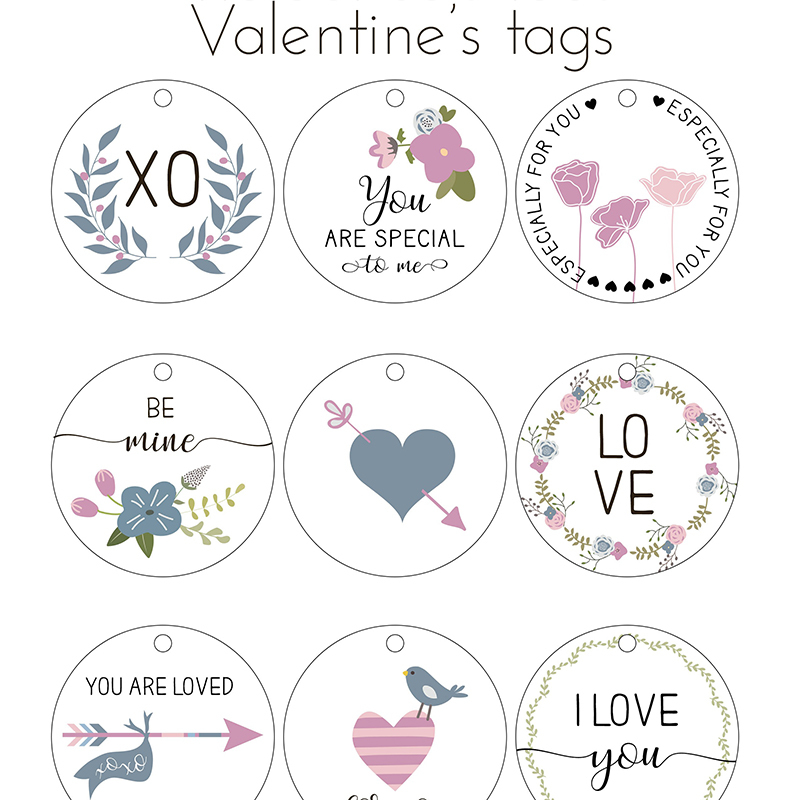 And the last element of our collection is this printable Valentine’s Day tags pack. Aren’t these tags lovely and cute? 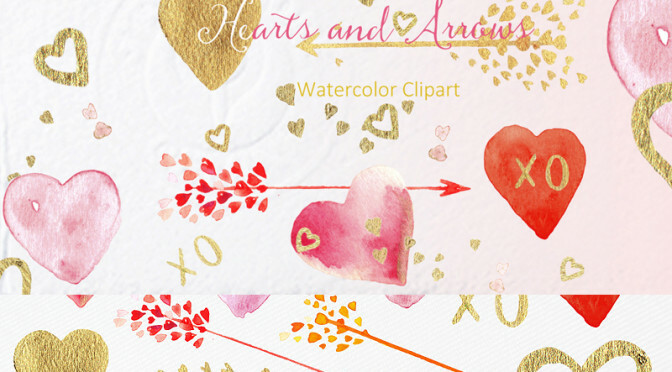 These tags, like other themes and watercolor sets, are just perfect for this holiday. However, you can use them whenever you want. Besides, they are at no charge – so to have them, you even don’t need to spend money! Just follow the link above, click “Buy for $0” and you’ll get them on your email for free! 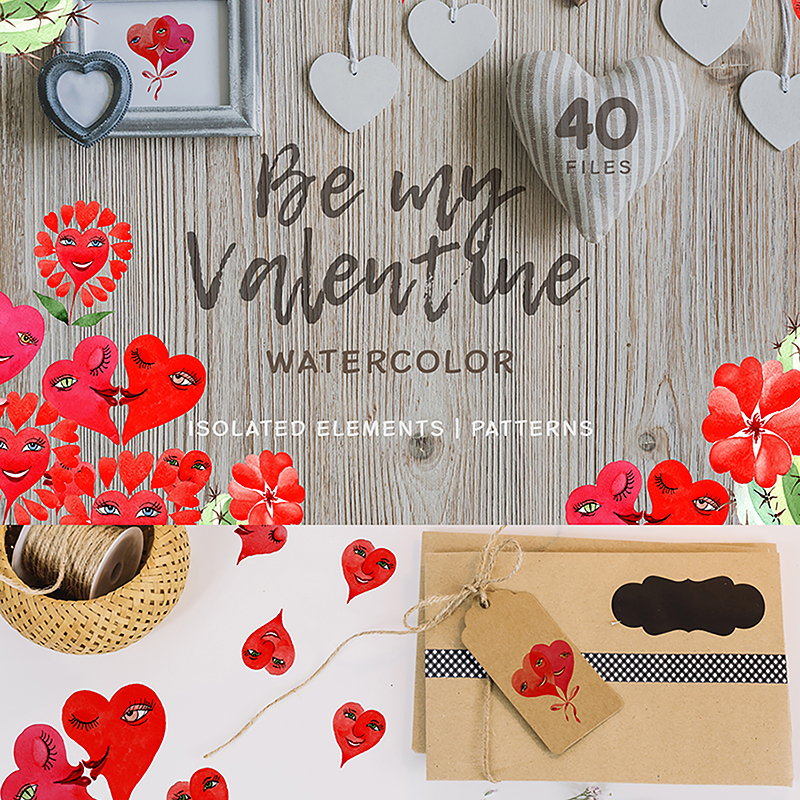 I hope this post was useful and timely and you will no longer worry about decorating your website for St. Valentine’s Day. 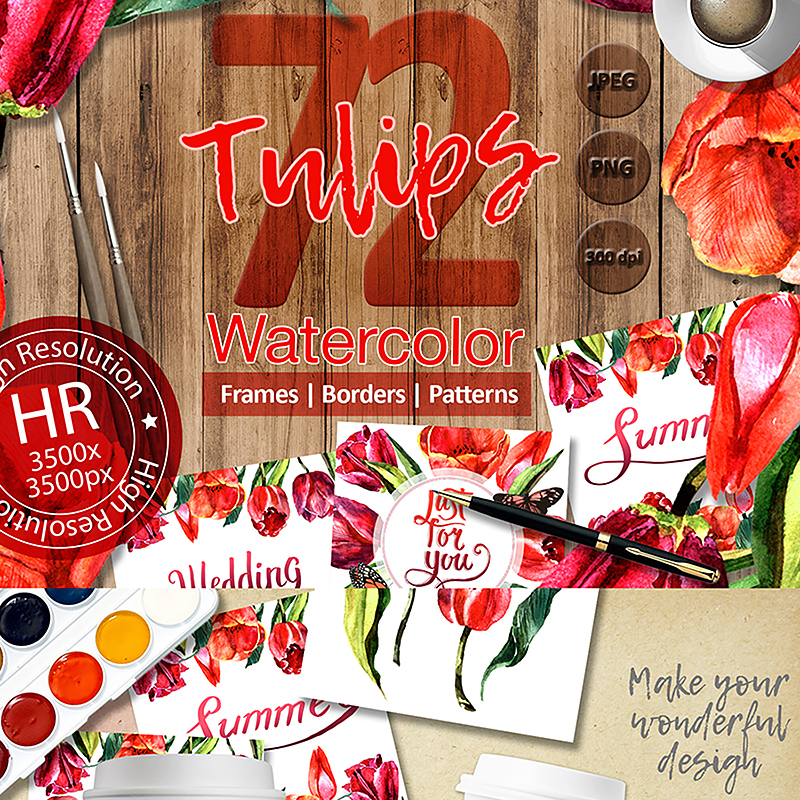 In addition, if you want even more options, then go to the MasterBundles site – you will find a lot of decorative elements and fonts there. On St. Valentine’s Day, men and women, girls and boys who have a passionate and warm feeling of love, give each other gifts or just have a nice time together – spend this time likewise, taking care of your site in advance. The WordPress themes market is like the modeling world. What? Did you think the life of a model is easy and pleasurable? That models live like in heavens, visit the luxurious parties, wear fancy clothes and do almost nothing? You are very wrong then because the modeling world is more like a box with snakes or a pool with sharks – harsh competition, strict limitations, and constant hard work. WordPress templates market is also something like that. It is very good for users because they get the best products possible, but the fighting behind the scenes is cruel. There will be only one survivor! (In fact, there will be much more than one, but you got the point). With the launch of WordPress 5.0, some of the requirements changed. 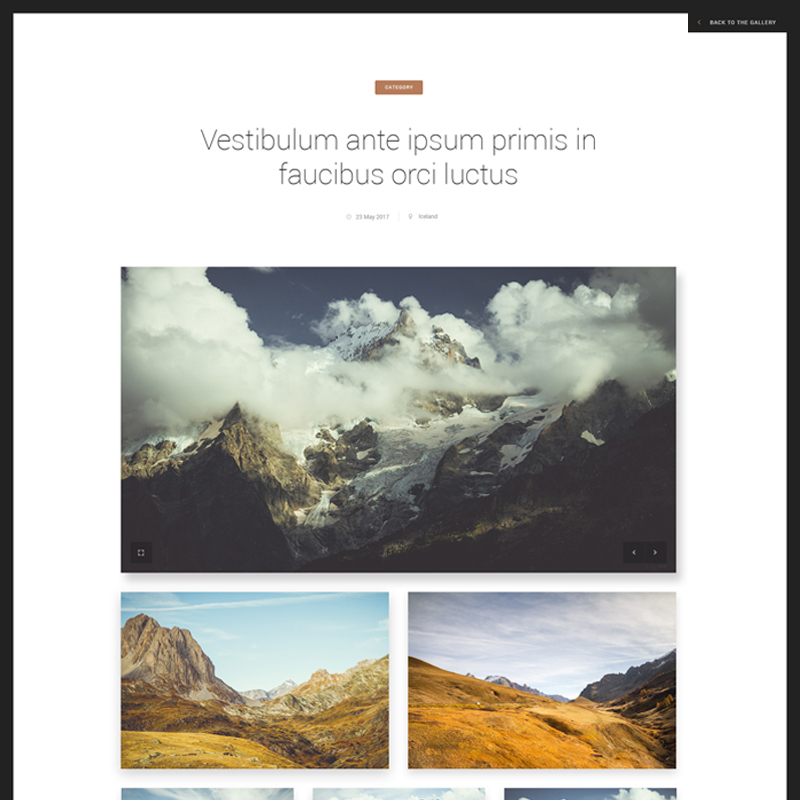 The WP team announced they are going to include the new default page builder into the next update about a year ago. The news about Gutenberg shake the society and most of the template creators start to prepare for it. That’s why a lot of WordPress 5.0 compatible themes were already on the market when the update has been released. Marketplaces start to put “Gutenberg compatible” banners on their products (look at this responsive website templates from TemplateMonster – the red banner is right there). So, technically, there are dozens of templates, compatible with WordPress 5.0. But as it is the latest update it is worth the best themes, created according to the latest trends. I will list you the features you have to check out when choosing a template so that you could be sure you get the best item possible. In fact, it’s enough if the template has at least one of them. Let’s take a look! By the way, if you need fresh and quality design & development bundles you could find it on MasterBundles. Nobody likes to wait, the time is money and users don’t want to waste it. The longer your website loads – the smaller is the possibility users will patiently wait for it. It is more likely that a person who had to wait longer than 10 seconds will leave the slow website and go looking for a faster one. When looking for a template for your shop or blog make sure it will be the fastest possible one, so you will have some spare space for your content. Modern society addiction to smartphones and constant internet connection is such obvious that a bunch of jocks, memes, and quotations have already appeared about it. It could be funny indeed, but at the same time if you want your website to be sufficient you need to make it responsive. People surf the internet while going to work or go home and you can’t afford to ignore them, otherwise you will be the one ignored. The template compatible with WordPress 5.0 has to be built on mobile-first philosophy. 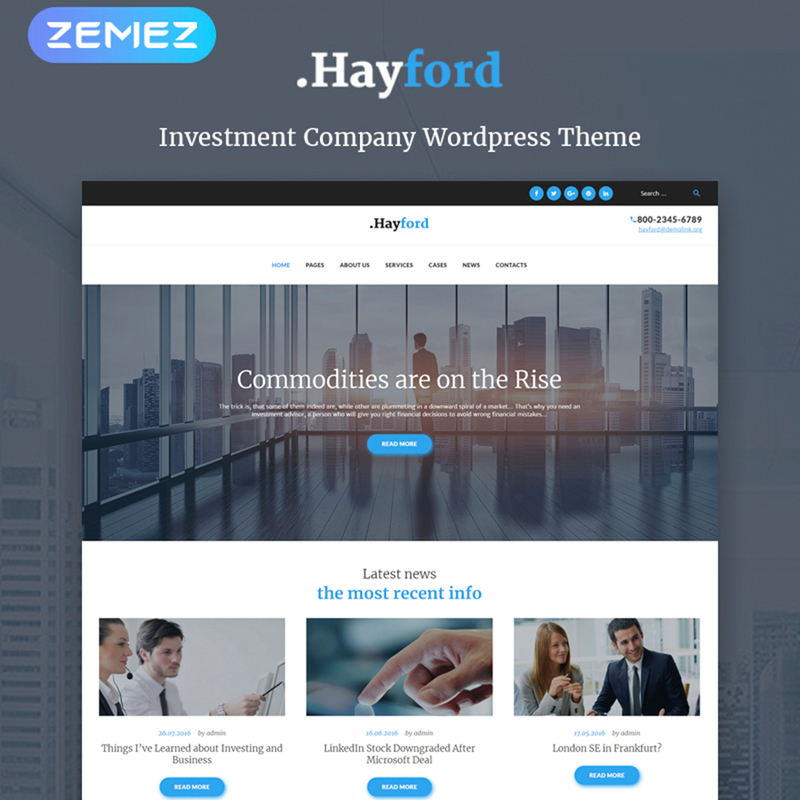 Hayford theme creators were thinking about responsiveness while building it, so choosing it you can be sure that the pictures will look perfect either on PC big screens, tablets, and mobile phones. 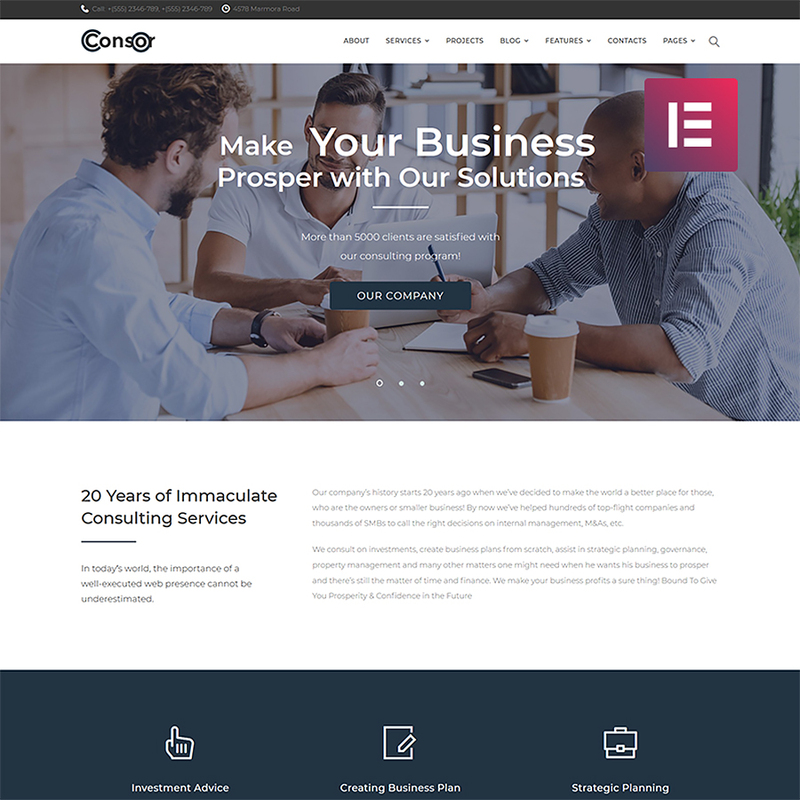 This template is a real modern business company website solution, stylish and reachable from every device. Search engines are capricious – they can find a website only if it is properly organized. The biggest part of search engine optimization lays on a special person, SEO professional, but if the template you choose is clear and accurately coded it does a part of a job. The themes created with SEO in mind are easier to customize and get the higher search ranks. If you want the clients to find your website on the first Google search results page – you need to get yourself an SEO-ready template. You can take Globy theme, by the way. It has valid and clear coding, understandable documentation and is definitely SEO-ready. Either you do it for yourself or hire a specialist, it won’t take too much efforts to make your website fall to the top of search rates if you use this template. Every template has to be customized to fit the unique requirements of a concrete business. The more versatile the template is, the more pre-made pages it has – the lesser will the user have to change. 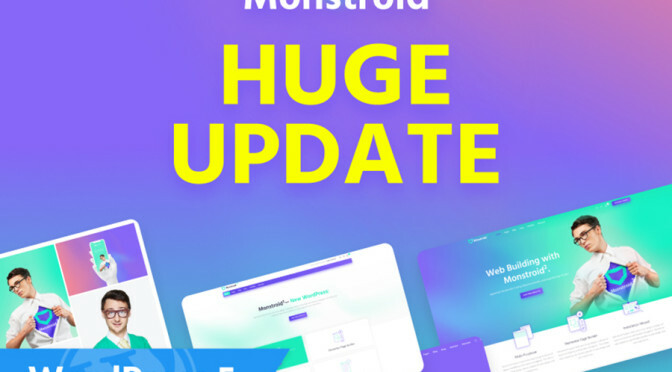 Multipurpose WordPress 5.0 compatible templates will be the top trend of 2019, so keep that in mind. When you download a template with a bunch of pre-made pages – it gives you an opportunity to construct any type of website you like without writing a single row of code. 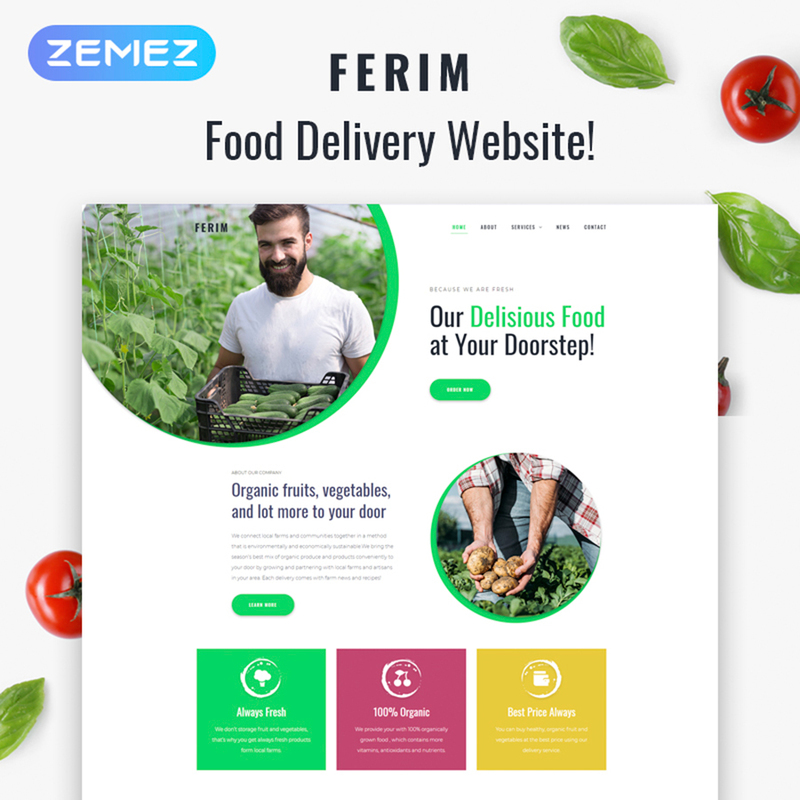 Pay attention to Ferim – a perfect multipurpose template for a food delivery company and a farm. It has a handful of ready-made pages, so you can combine them any way you like. 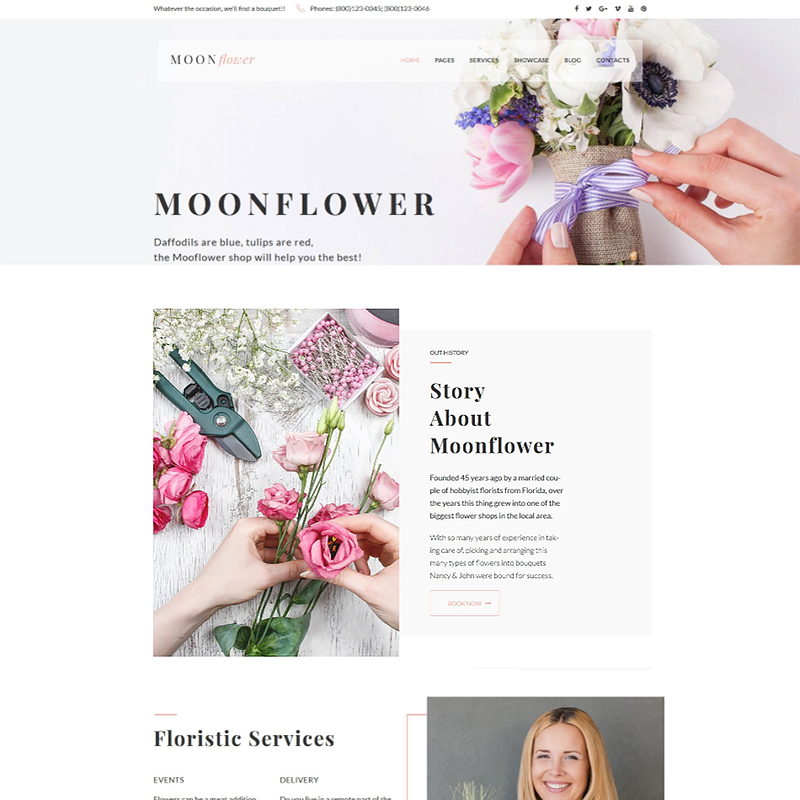 If your business is connected with food or plants – you just can’t miss this WordPress 5.0 compatible template. Imagine the situation when you create a blog and that, after a few months, realize that you will get a sufficient income if start selling something. To add an online store to your shop you will need it to be ready for such an action. Or maybe you created a corporate site and then want to add a blog. You will need the template to have a blog option. A lot of themes are made compatible not only with WordPress 5.0 and Gutenberg but with different eCommerce software too and lots of themes have blog module you can use or deactivate. 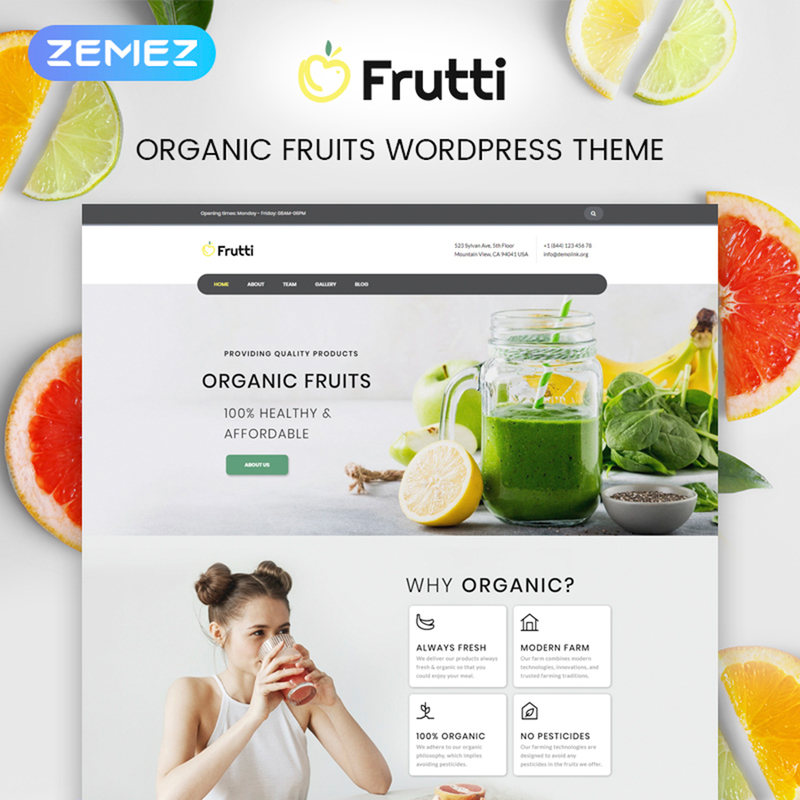 Frutti template is Ecwid-ready, which makes it an ideal candidate to become an online store. With it, you can start as a lifestyle or healthy life blogger and after some time, when your audience will be big enough – open a little store of fruit juices or healthy nutrition. On the other hand, Growlex is a template perfect for a business company (it could be a digital agency, marketing company or law firm). If you would like to add a blog either the latest company news or a gallery with photos of employees – it won’t be a problem, because the theme includes that blocks. It will take just a few clicks to activate it. Animation effects, if they are chosen and added with taste, could sufficiently spice up the website and make it more attractive. Smooth parallax effect and accurate hover animation (like animated boxes and tiles) decorate the pages and add some dynamic feeling to it. 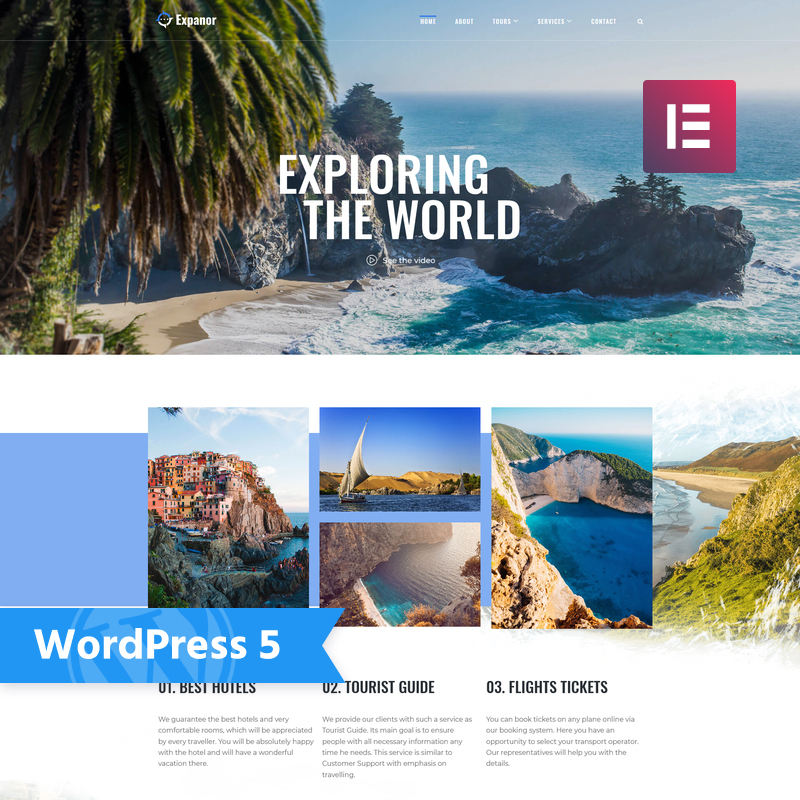 If your website has to be connected with motion – choose the template that will not only be compatible with WordPress 5.0 but also has some animation. Nothing could make the visitor leave the website faster, then inconvenient navigation (except, maybe, slow loading). Nobody will desperately seek some information or product on your website – the client will just go away and try to find it somewhere else. That’s why modern, WordPress 5.0 compatible website should have simple and understandable navigation (mega menus, sorting options, AJAX search tab will do the job). Take a look at this nice construction company website. The visitors of a construction-based website expect it to be easy in use – in the end, its owners build houses that have to be convenient. Constico template will help you to match the clients’ expectations and makes it pleasurable to go through the site. The same situation is with Consor template – the visitor meets no issues when he wants to find some kind of information. The theme was built for a business consulting firm, so it would be strange if a user won’t be able to find a piece of advice he needs on such a website. If there’s a problem and you don’t know how to solve it is very important to know where to go for advice and support. Before getting yourself a template check carefully if the marketplace offers enough tech support. It will be definitely useful to know how much time you will have to wait for the response and what kind of help you will be able to get. 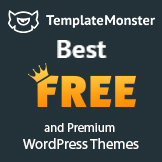 Soothery template, just as all TemplateMonster themes are supported 24/7 by a friendly tech support team. If you have any problems you can not only leave a ticket but also have a chat with the support specialist or even get some help via phone call. TemplateMonster is rightfully honored with the level of support it gives to clients, so you won’t be disappointed. Look at your chosen template, then back to the list. Then back at your template and again to the list. If your theme has at least two of listed features – you did everything right and have chosen a good solution for your website. Popularity is a very capricious thing, trends appear and vanish very quickly, but if you choose a WordPress 5.0 compatible, professionally designed and filled with useful features template it will serve you much longer than some low-quality samples. Don’t hesitate to spend some time choosing and I guarantee that results will be worth it. To say that mobile is the future of business would be an understatement. Heck, the mobile revolution is happening right in front of our eyes. Smartphone usage is at an all-time high given the wealth of apps and more and more mobile-friendly sites coming along. 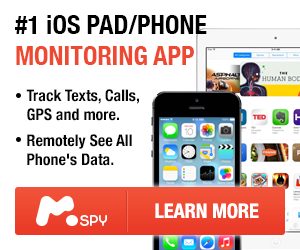 Additionally, the public at large is comfortable with buying via mobile like never before. Given these trends, businesses rightfully want to capitalize on this new wave of mobile customer ready to spend. That said, doing so effectively requires keen attention to detail. To help you do the same, we’ve broken down six mobile marketing tips for 2019 and beyond. Push notifications are the holy grail of mobile marketing if you’re trying to score more engagement through your app. The ability to access users around-the-clock is game-changer versus in-app notifications alone. Making sure push notifications are enabled is just one piece of the puzzle, though. Such details might be small, but can make all the difference for getting people to spend more time in your app. This tip applies specifically to brick-and-mortar stores looking to get more out of mobile customers. From Apple Pay to widespread digital wallets like PayPal, think “the more, the merrier” when it comes to mobile cash options. The upsides of accepting mobile payments include appealing to younger customers while also making transactions speedier as a whole. It’s a win-win for customers and merchants alike. Email is the preferred method of contact for today’s consumers, hands down. And here’s some more food for thought: 60% of emails are read via mobile according to Constant Contact. Yes, that’s a majority of all emails. Email may be an old-school marketing method, but it’s still as powerful as ever. Granted you’re optimizing your emails for mobile using snappy subject lines and short copy, you’re on the right path. Double-checking everything from text-based messages to image-heavy marketing emails via a mobile-friendly preview is a smart move regardless of what email service you’re using. Most brands are aware of their mobile traffic and more likely than not have rolled out responsive design on their sites. For example, consider conversion killers on mobile sites including needlessly long form fields and pop-up menus can still appear on responsive sites. You need to think about what the user-experience looks like for yourself and how you would respond if another site required you to go through a bunch of hoops. If you’re avoiding these snafus and likewise have high conversion and low bounce rates from your mobile visitors, more likely than not you’re golden. On a related note, don’t forget the wonderful world of SEO as part of your optimization strategy. Although some pieces of mobile and desktop SEO are apples and oranges, remember that it’s crucial not to sacrifice readability for search performance. This means that readability (think: text size and scrolling) and site speed (think: the faster, the better) should be your top priorities. This quick guide to mobile SEO can further clue you in on what’s considered standard for toady’s mobile sites. The rise of mobile customers isn’t going anywhere anytime soon, especially as we as consumers become increasingly dependent on our smartphones. Standing out via mobile represents a series of smaller steps versus one big “fix.” As a result, tips such as the ones above are crucial for maximizing your earning regardless of what you’re selling. Zenni optical free shipping and coupon codes and 30% discount voucher. Zenni optical is best online place for low price glasses and frames. You all might have heard that Zenni optical offers one of the best glasses at competitive prices, But today I want to share you how you can even their product at even lower price. 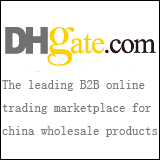 B2G1 – Buy 2 Get 1 Free when you spend $75 or more. Plus you will get Free Shipping on your entire order. 10% Off – Receive 10% discount on minimum purchase of $100 Gift Card. Check for for gift of options. VET15 – Veteran’s Day Flash Sale! Get 15% off on order of $50 or more. BUY2GET1 – Buy any two frames and get 3rd for FREE. Simply apply the code at checkout page for availing this offer. Coupon : MEMORIAL20 – For a limited time only you can save 20% on your purchase of photochromic lenses. Valid for current week only! Zenni optical codes and coupons are the one that you can use for your any online purchase to get save huge on prescription glasses and frames. Many time customer enjoy discount on already reduced price items, So you should check our tips given here. Before going in depth, let me tell you one thing is that Zenni was founded few year back by the team of scientist and professional people to provide the glasses at lowest possible price with unmatched quality. How to use Zenni optical Coupons and Promo codes ? Currently you can use “RED10” or “TENOFF” to enjoy 10% discount on your any online order. 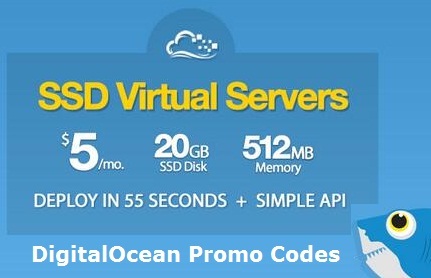 Above codes are valid for any order of $100 and more. Good news is that you’ll also get Freebies like case, cover and other goodies for free on your any frame or glasses purchase. Zenni optical promo and coupons provided here are subjected to expire, So please make sure that you get associated discount before it gone away. I usually try to provide most recent deals here, So you may always see different code that is valid for your next order. You can also enjoy Free Shipping on your any order of $120 and more. In case of any question or queries you can post your comments here. Also please bookmark this page to get most recent offer before you purchase anything from Zenni.